we love going to the zoo on a beautiful, cool morning!! the animals always seem so active! I already like you on fb and in real life! Our latest favorite outing is walking around Mass. Ave: we start out by playing at Mass Ave Toys, learn about the symbols at cross walks, stopping by Global Gifts & Nurture, listening to live music outside of the Chatterbox, and ending with frozen yogurt! Its great to give things away and even greater for the one who recieves! What a great contest! 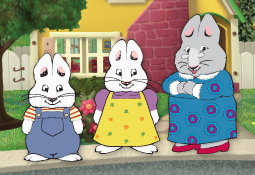 Madeline would freak over seeing Max and Ruby live. Our favorite outings are exploring a section of Indy like Mass Ave or Midtown or a smaller town. We hit up a shop for kids, a shop for Mama and a local restaurant or coffee shop for a treat. She's happy, I'm happy and we can support local. And of course I follow you on Twitter already! Sharred link on my FB wall! Thanks for the awesome giveaway, so sad I missed it though. I love live music long island, and I could have watched it for free. I'd love to get guitar tabs chords to their songs, so I can perform for my kids.